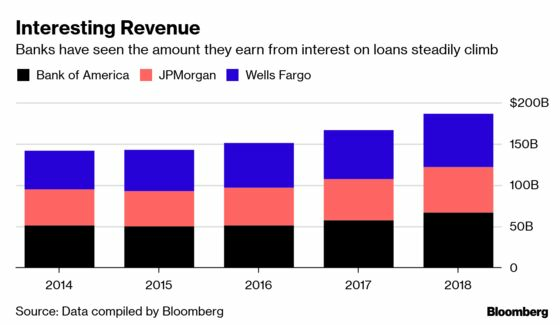 (Bloomberg) -- Three years after the Federal Reserve started raising benchmark interest rates in the U.S., what the country’s biggest banks pay depositors is shockingly low. Like next-to-zero low. At Citigroup Inc., it’s 0.04 percent. At JPMorgan Chase & Co., it’s even lower: 0.01 percent. How is that possible? Because clients haven’t seemed to care all that much about getting paid more. They’ve kept depositing new money anyway, so there was no pressure on these banks to push up rates and absorb additional costs. 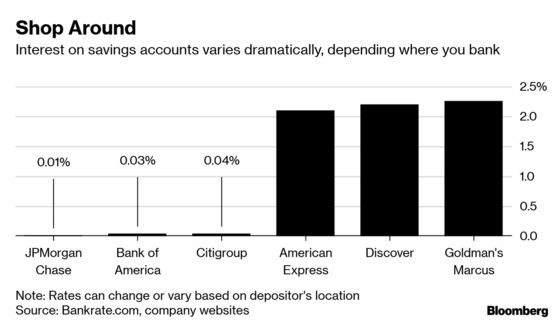 But there’s a whole set of other banks out there -- generally a lot smaller, more digital and hungrier for new cash -- that are aggressively trying to lure depositors. In this universe, which includes American Express Co. and Marcus, the new consumer unit of Wall Street giant Goldman Sachs Group Inc., savings-account rates of 2 percent or more are common. Now, this might not seem like much in historical terms, but when compared to the Fed’s benchmark rate, at 2.5 percent, and the U.S. 10-year bond yield, 2.4 percent, it’s not bad, especially in an economy where inflation is a mere 1.5 percent. Some Americans seem to finally be taking notice. Deposit growth at many of these online banks is quickening. While the flows into these lesser-known names isn’t of a magnitude that would have much of an impact on the nation’s top banks, they are starting to hurt the ones just a notch below these behemoths. Regional banks like Citizens Financial Group and U.S. Bancorp. Both of them have said in recent weeks that they’re finding it harder to attract deposits and anticipate having to bump up the rates they offer. The average rate on a checking account is still a measly 0.29 percent, up from just 0.24 percent a year ago, according to Informa Research Services. “It went from really, really bad rates to just really bad rates,” said Ray Montague, Informa’s director of deposit-product research. That’s one reason consumers have been slow to move their cash: Rates just haven’t been high enough to make a difference to the average consumer. For someone with $1,000 in savings, a large bank offering 0.05 percent pays out 50 cents a year in interest. Moving to a higher-yielding account -- say, the 2.25 percent offered by Goldman’s Marcus product -- would yield $22.50 a year in interest. 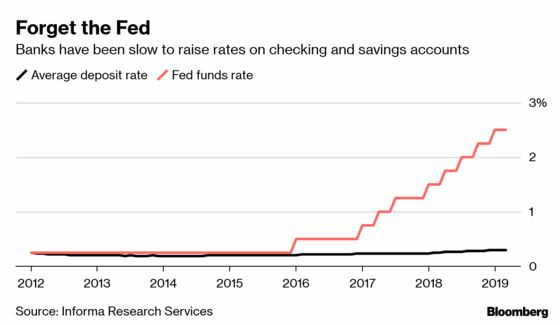 The top banks have been the biggest beneficiaries the Fed’s rate hikes, which lets them charge more for loans while the amount they parcel out in interest on checking and savings accounts stays relatively stable. At JPMorgan, the biggest U.S. bank, deposits have been surging despite the paltry returns, rising at twice the industry average since 2014. At regional banks, rates have looked a lot like they do at the very top. On average, savings accounts at the 50 biggest banks pay just 0.05 percent. The pressure building on some of them to start bumping those rates up comes at a tricky time, just when the Fed is signaling that it’s concerned the economy is slowing and it’s unlikely to keep raising the benchmark rate. That will make it hard for them to further bump up the rates they charge on loans while they lift payouts on savings accounts, squeezing their margins.